I love co-op gaming. Ever since I was a child, I have loved teaming up with friends to beat a game together. But Journey taught me something I had missed out on, the joy of teaming up with a complete stranger. When it comes down to it, Journey is almost a “stealth co-op” game. It never tells you as you play that the other characters you run into are real people. In fact, I have had friends playing on my system reach the end before discovering this. Journey’s co-op is something special. As long as your PS3 is connected to the net, you are playing it in co-op. But you have no choice when it comes to your partner—that is all handled by the game in the background. You can’t even choose to play with a real world friend if you want to. But more than that, there is no typical way to talk to your partner—no voice chat and no text chat. All you have for communication is the ability to “ping.” Yet with only this most rudimentary form of communication, you make friendships. As a pair, you feel joy as you discover something together and sadness as your partner gives a final few pings and disappears as they log out from your game. Unlike Demon’s Soul, which has a similar “stranger invasion” style of multiplayer with limited communication options, Journey is a game where you can’t hinder; you can only help. In fact, the worst you can do in Journey to someone is to wander off in the wrong direction and hope your partner follows you. 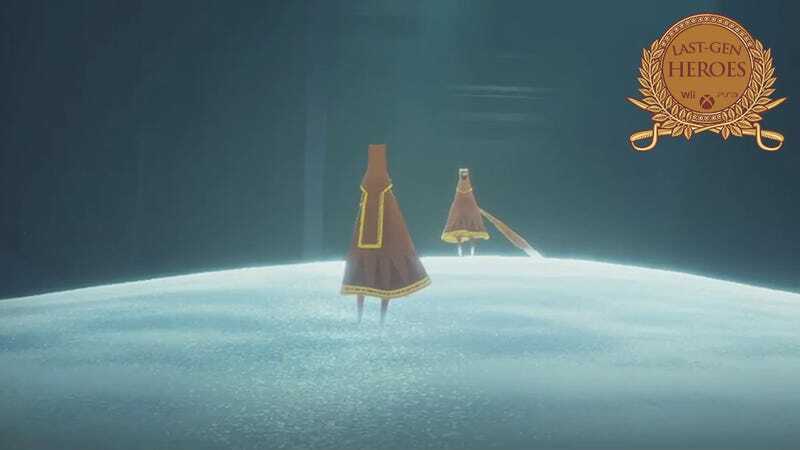 Thus, without any way to cause the other player grief, Journey becomes a game with a true cooperative spirit. And then there are the white cloaks. These players, who have mastered the game, continue to play it for one reason only: to help others. Some will just help newbies reach the end of the game. Others will expose the game's every secret—effectively training the other player to become a helpful white cloak in his or her own right. But white cloak or red, all you know of the people you are playing with is the geometric symbol that appears above their heads when they ping—until you beat the game, that is. That’s right. The reward for beating Journey is getting to learn your partner's name so you can make contact. It's only when the journey is truly over that you learn about the person you spent several hours playing with. It is a reward with real emotional weight. And that is amazing. Journey's unique take on multiplayer made what was already a wonderful game into an experience unlike any other. Even today, over a year past its original release, I can hop on and immediately be matched with a new stranger for a new adventure. In the end, it’s the one game I have where I end up with a new friend or two each time I play.